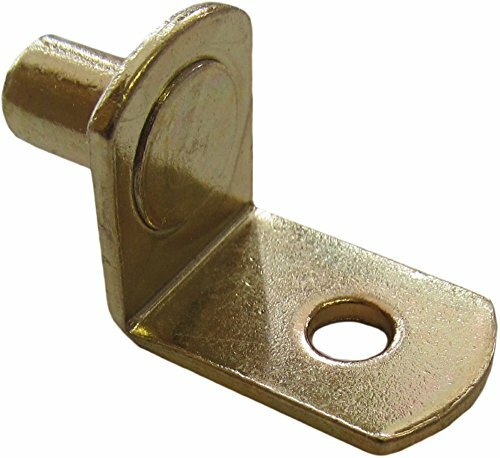 Dugan Hardware Systems "Bracket" Shelf Supports... The professional cabinetmaker's choice! These shelf brackets from D.H.S. combine fantastic strength, superior tear-out resistance, and a great esthetic... all at a price you can afford. These shelf brackets are the "last word" in terms of strength. The shafts are 1/4" in diameter, for a perfect fit. The "L" that supports the shelf is 1/2" wide and extends into the cabinet a full 3/4". But it's the actual design of the shelf bracket that will instill enough confidence to stack up as many canned goods as your shelves can fit! You see, when the shelf is installed, it actually keeps the brackets firmly inserted in the cabinet holes, making tear-out impossible! Nice! Whether you have kids who like using bookcases as ladders, or want to prevent co-workers from messing with your shelf placements, each bracket has a small hole so that shelves can be permanently set with a few screws! Our shelf brackets are finished with a beautiful polished brass plating, so they'll look like new for years to come! Hate dealing with polybags or those impossible-to-open "blister cards"? Us too! That's why our shelf supports come in a handy cardboard box. Easy to open... Easy to store! Better for the environment too! Buy 'em, Try 'em, Use 'em, Abuse 'em for up to 30 days. If you're not satisfied for ANY reason, simply return them for a "no questions asked" 100% refund! IDEALLY SIZED - Fits all cabinets with 1/4" holes. Each is 1/2" wide and projects into the cabinet a full 3/4"
If you have any questions about this product by Desunia, contact us by completing and submitting the form below. If you are looking for a specif part number, please include it with your message.